Define flexion, extension, sidebending and rotational forces on the spine. Demonstrate how unilateral movement, or lack of movement, places rotational or sidebending forces on the spine. Identify exercises in every plane of motion that can enhance spinal lengthening. 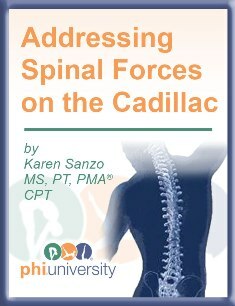 Discover how the cadillac can enhance ideal recruitment patterns of the postural muscles with open and closed chain exercises.